It wasn’t that long ago that Skype was updated for Windows 8 and we’re glad to see that they are working hard to bring us all the features we want. Bit by bit. The latest update to hit the Windows Store brings with it the oft-requested feature of a functional snap view to allow for a better work flow. We have a little more on that after the break. The app reports itself as being version 1.3.0.111 upon being updated. On the main screen it will advertise that you can now snap the app to one side. While not a huge update per se, we can report that the app is slowly climbing the ladder of usability on the Surface Tablet and now passes as ‘decent’. The major thing here is that snapped view, while there is little reason to run this app in full screen mode there is plenty of reason to snap it. The snapped view is similar to what most people are used to with IM clients like Messenger, a straight up list of contacts. You now have the ability to kick off a conversation via instant messaging or to conduct a video call all while getting on with your work. Not much other functionality has been added beyond that. The crazy UI choice of putting your people tab off the main screen while in full screen mode is still present as is the need to swipe over, press ‘People’ and then press the ‘Available’ tab to see who is actually online. You couldn’t make that up if you tried, but that’s the point, they didn’t. Gripes with the user experience in full screen mode aside the app works much better in the snapped view and for that we are thankful. We certainly hope to see many, many more updates to Skype coming to flesh out the features now it’s being ushered in as the replacement for Messenger. You can download the app from the Windows Store here. If you have already downloaded the app and are not seeing the update, check for them in the Windows Store app. *TIP* To check for updates check updates in the Windows Store, swipe over to reveal the charms menu, hit settings, click on App Updates then hit 'Check for updates'. 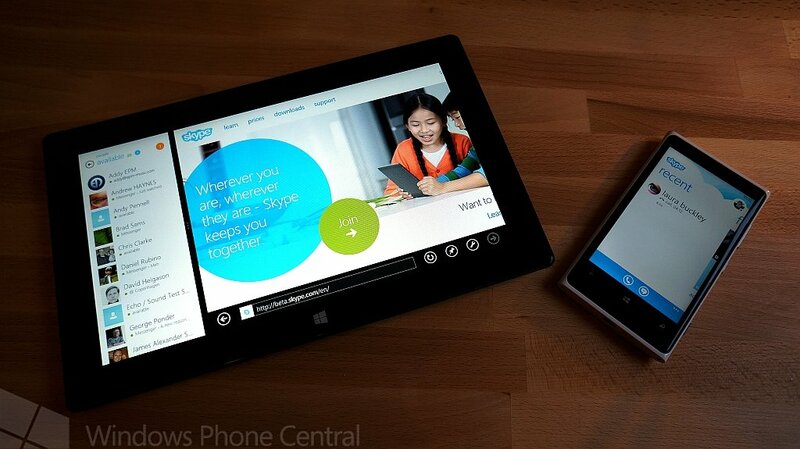 While we have you here, what do you think so far of the Skype and Messenger integration currently taking place?